The Sea Shell Resort and Beach Club located on Long Beach Island, NJ (LBI) brings a little bit of the Caribbean to the Jersey Shore. The resort features 53 rooms and suites, as well as two on-site restaurants, a sushi bar, outdoor tiki bar, and 10 South — LBI’s only upscale martini lounge. Also, its unique cabana service allows guests to place their food and drink orders right from the beach or poolside. Sea Shell Resort wanted to find a solution to make its cabana service more efficient and reduce the time it took to serve outdoor guests. Inside, the resort was using its 13 POSitouch Point of Sale (POS) terminals to provide service to these guests. However, this required waitstaff to walk out to the pool or beach area, take the orders, then walk all the way back inside to enter the order. In some cases, this meant walking the length of a football field or more to take an order and input it into the POS system. The server would often wait inside while the restaurant or bar prepared customer favorites such as fish tacos or a blended daiquiri, and then walk back out to serve it. As a result of this time-consuming process, outdoor guests waited much longer for service compared to those dining inside. It also meant servers spent a significant portion of their shifts walking back and forth and waiting for orders rather than maximizing sales during the summer, the resort’s peak season. Resort ownership turned to its trusted restaurant solution provider Buzz Cmaylo of CC Productions for help addressing this need. 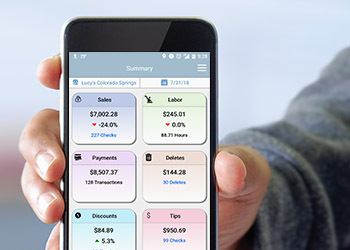 Since the resort has been a POSitouch customer for 18 years, CC Productions suggested adding POSitouch’s mobile POS capabilities to their current framework. Last year, POSitouch began to offer a bundle that included software licenses, free EMV terminals for all workstations, and lower credit card processing fees through POSiPayments. The resort took advantage of the offer to move forward with adding mobile POS — and the opportunity for quick ROI. CC Productions provided Sea Shell with specs for Android tablets for the mobile solution. After testing, Sea Shell chose an 8-inch device with the ability to adjust brightness. While this may not seem like a big deal for other businesses, it’s a necessity for the resort because the staff is working in direct sunlight. Adjusting the brightness allows servers to quickly and efficiently take orders from their outdoor guests. The resort needed 16 tablets for its outdoor service but chose to purchase 20 to avoid any downtime if some were in need of repair in the future. Buying additional devices was a smart decision on their part considering the salty air and other beachside elements that can take a toll on electronics. Taking it a step further and considering everyday use, they also bought tablet cases with hand straps that make it easier and more comfortable for servers to operate. The solution includes an enterprise-grade access point to provide service to the pool area and beach. The solution has multiple channels, enabling a secure subnet for resort use and the bonus of guest Wi-Fi on the beach. Servers can easily manage charges to guests’ rooms and take cash payments right from the tablets, and POSiPayments enables IP-style EMV card readers, which can be installed anywhere with a network connection. Servers take the payment card to the closest reader — for example, one mounted near the pool bar — to authorize and complete the payment transaction. The resort launched the new mobile POS solution before the start of the Summer 2018 season, along with changes to its operational process to elevate efficiency. Now, servers — the most skilled at customer service and upselling — take orders using the mobile POS solution and transmit them directly to the kitchen or bar. The second team of expeditors delivers the orders as soon as they’re prepared, minimizing wait times for guests. In the meantime, the servers continue moving from cabana to cabana to beach chair, maximizing peak season profits. The solution has also positioned Sea Shell Resort to take advantage of future innovations from POSitouch. POSitouch is continually developing new and exciting features and capabilities that will empower resorts, restaurants, and bars to offer a higher standard of customer service and to maximize their revenues. The Sea Shell Resort recognized there was a significant gap in promptness, efficiency and overall customer experience between indoor and outdoor diners. By adopting mobile point of sale technology, they can close this gap, bring customer service to the next level, and give guests a cohesive dining experience no matter where they sit. Let’s not forget, the waitstaff no longer needs to run a 40-yard dash to provide outdoor customers with quality service. Also, the added role of expeditor has created a few jobs for the local economy — a win-win for all involved!